MorganKing Associates presented Annie to full houses in Southend-on-Sea in May 2007. The old-time favourite of orphan Annie is always a favourite with audiences worldwide and this was no exception. With songs like 'You're never fully dressed' and 'The Sun will come out tomorrow' the show has shown it can live on successfully into the 21st century. 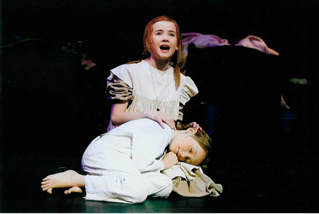 The role of Annie was shared between Roseanna Tilley and Abbie Phillips - both girls giving excellent performances, along with the orphans and the adult cast. This show was MorganKing's follow-up to its award-winning performance of 'The King and I' last year. The show, once again, showed the depth of talent that exists in Southend playing local theatres.